New Delhi: Prime Minister launched 'Saubhagya' power scheme on the day BJP held it's first ever televised National Executive Meeting from 10 am to 5 pm in New Delhi. 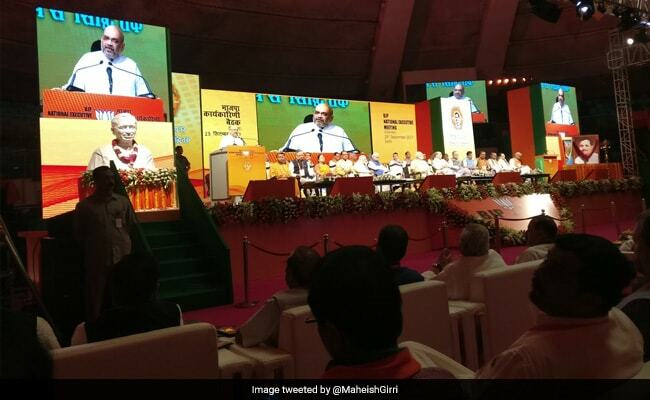 BJP President Amit Shah opened the meet by addressing BJP leaders and party workers from across the nation. Prime Minister Narendra Modi gave a speech to all partymen at the end of the day-long meeting at Delhi's Talkatora stadium. Those attending the meeting included thirteen chief ministers, 1,400 legislators or MLAs, 280 MPs or parliamentarians, among others. In all around 2,500 partymen attended the day-long meeting. 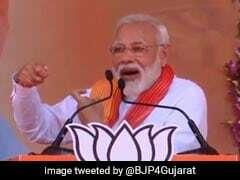 Rs 16,000 crore will be spent to provide free electricity connection to poor, said Prime Minister Modi. "No poor will have to pay for electricity. Government will go to their houses to give power," said the Prime Minsiter. New India will not only have power in all villages but in every home: says PM Modi at the launch of power scheme, Saubhagya. "Earlier government never took any step against black money and corruption. It was never part of their agenda. That's why any step against black money and corruption can never be supported by an UPA leader," asserted Arun Jaitley. 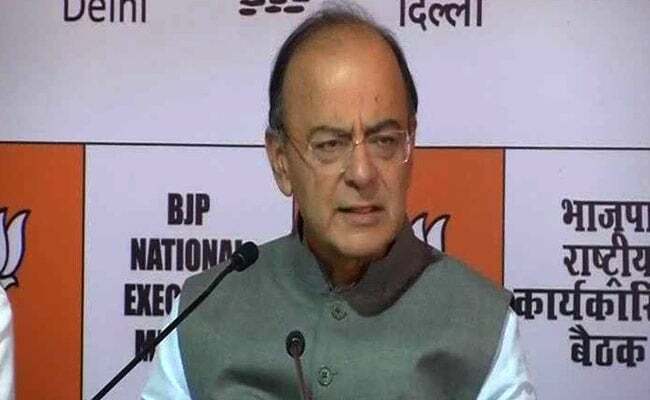 Taking a potshot against harsh language used by Congress leaders in tweets, Mr Jaitley said :"Earlier, being in power used to be a upbhog (luxury). That's why they don't understand how to be in opposition. "Sometimes they use very harsh words.Harsh language cannot be a substitute for any substantive charge against the government," Mr Jaitley added. With the mandate that we have got, we are taking democracy beyond elections, said Mr Jaitley. Drives against corruption, terrorism call for mass participation, he added. No political organisation is as active in the country today as the BJP is, says Finance Minister Arun Jaitley. Finance Minister addresses media after BJP's first ever televised National executive meet today. "It was held on the birth anniversary of DDU that's it was an extended session," said Mr Jaitley. The Prime Minister also requested the party to fight political violence in Kerala big way. "No compromise with corruption. Fight will go on till it is wiped out." PM Modi asserted. "We did it peacefully. Many people remain surprised how we did it" PM Narendra Modi speaks on Doklam. PM Modi and BJP president Amit Shah talk to Uttar Pradesh Chief Minister Adityanath over Banaras Hindu University or BHU incident in which a woman student was beaten up with sticks by policemen during a protest on Saturday. Speaking at the BJP national executive meet, Union Minister Nitin Gadkari that the government has zero tolerance towards terrorism. "In China, during the latest BRICS Summit, the PM even ensured that a legislation be passed against terror groups in Pakistan and PoK. Getting the resolution to pass has been a big success for India and the PM deserves the credit for it," he said. 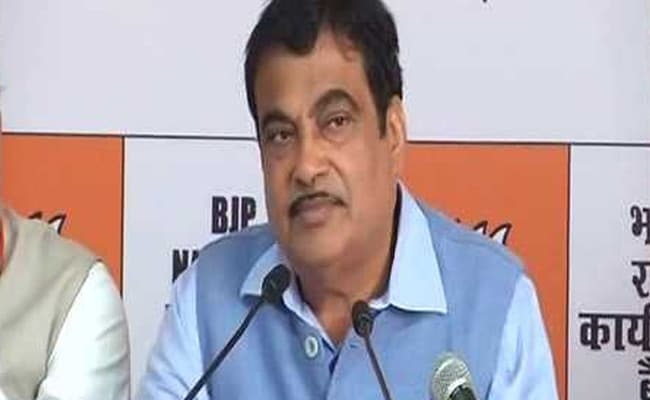 Union Minister Nitin Gadkari said that Prime Minister Narendra Modi has not only been extremely successful in raising the issue of curbing terrorism around the world but also in "exposing Pakistan". Speaking at the BJP national executive meet, Union Minister Nitin Gadkari that the government has zero tolerance towards terrorism. He also stressed on ensuring women safety following which he said any form of violence should not be supported. Addressing over 2,000 party workers in the national capital today, Amit Shah said that whereas BJP believes in politics of performance, the Congress believes in dynasty and politics of appeasement. The party chief today attacked Rahul Gandhi for his controversial remarks at Berkeley in California last month, where while answering a question on dynasty politics, he had said "this is how India works". Piyush Goyal praised party workers for taking BJP's message to the grassroots and making it the largest political party in the world. 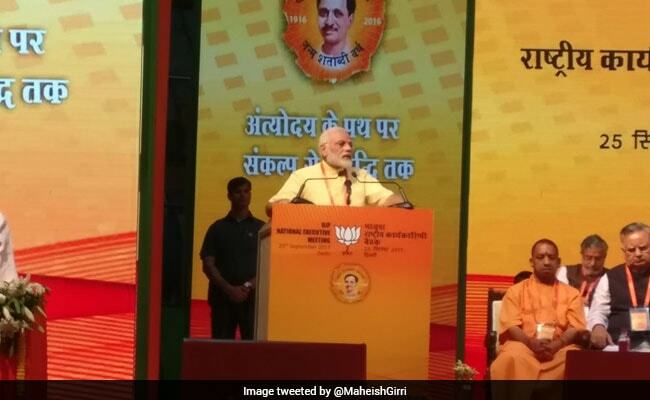 "Of over 9.5 lakh booths across the country, BJP workers have covered over 7.2 lakh booths. They have been doing a commendable job," he said at the party executive meet. 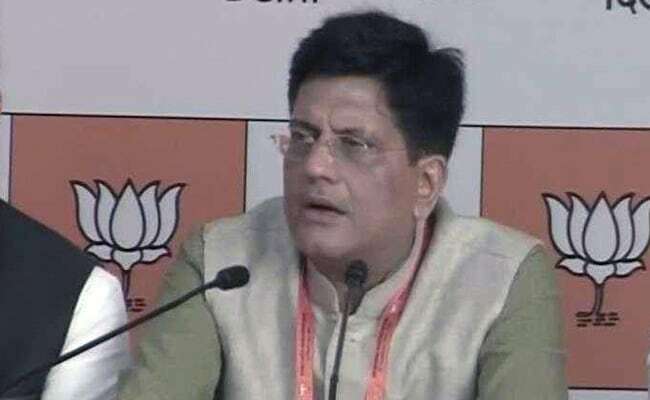 "Rahul Gandhi undermining India, Amit Shah gave befitting reply"
Reacting to Amit Shah's comment on Rahul Gandhi, Union Railway Minister Piyush Goyal said that the Congress Vice President has been undermining India these days, adding that Amit Shah gave him a befitting reply with facts. Mr Goyal's statement was made in connection with Mr Shah's comment on Rahul Gandhi, where the former said that "Mr Gandhi had got it all wrong" on his outlook on dynasty politics in India. 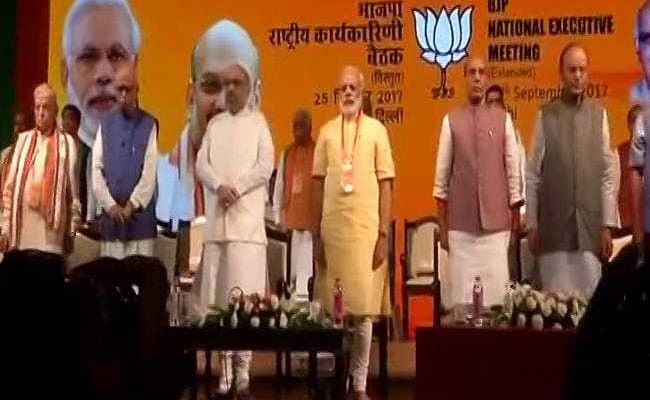 Amit Shah will conduct a 'padyatra' in Kerala to connect with the people in the state, Union Railway Minister Piyush Goyal said during the BJP National Executive meet. Rahul Gandhi has it all wrong - dynasty or family connections in launching careers is "a tradition of the Congress and not of India", NDTV has learnt BJP chief Amit Shah said today, responding to the Congress Vice President's controversial remarks at Berkeley in California last month." "Rahul Gandhi has it all wrong"
Amit Shah attacked Rahul Gandhi in the party national executive meet, over his controversial remarks at Berkeley in California last month, saying the Congress Vice President "has it all wrong - dynasty or family connections in launching careers is a tradition of the Congress and not of India." 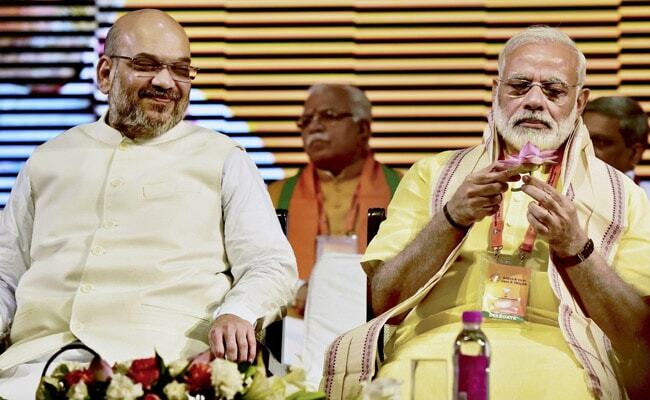 Prime Minister Narendra Modi, Arun Jaitley, Amit Shah, Rajnath Singh among others to commence the BJP executive meet. 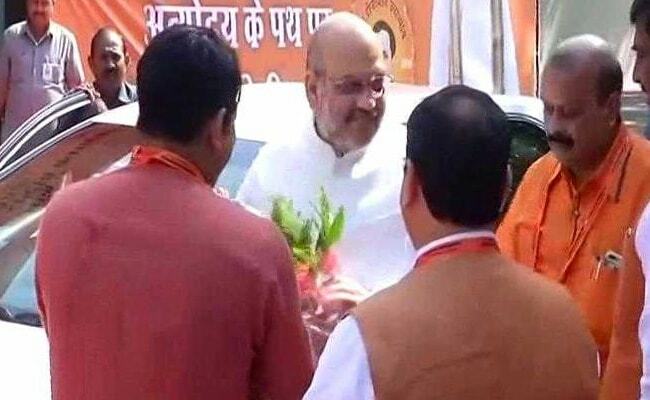 Amit Shah arrives for BJP's national executive meet. The party chief will open the meet by addressing BJP leaders and party workers from across the nation. BJP members arrive for the executive meeting at the Talkatora Stadium. The roll-out of the Goods and Services Tax or GST has been described by the party as a major success of the government which, it has asserted, will integrate the country's economy. The prime minister's agenda of development will also be a key feature. 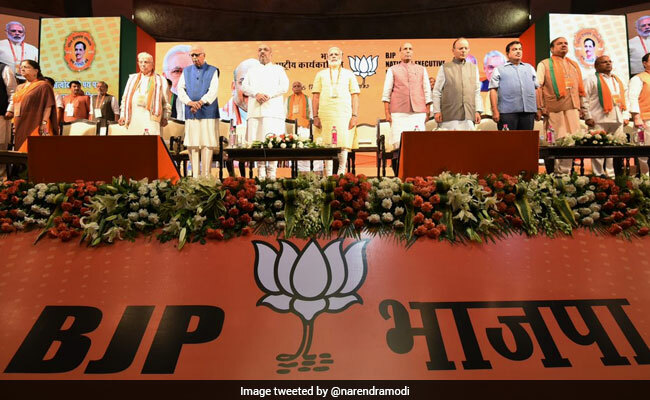 NDTV has learnt that the need for an open convention was felt after the Rashtriya Swayamsevak Sangh (RSS), the party's ideological parent, alerted the BJP about signs of a shift in public mood over the government's performance. Some of Sangh's economic fronts have even announced a protest in November to flag some of the government's failures. Taking a cue, Prime Minister Narendra Modi's concluding address, later today, is expected to be key and the high-point of the convention. He is likely to provide the broad guidelines how the party can revitalise its connect with the people. Usually, the National Executive chaired by party president, is attended by its 120-odd members and an equal number of special invitees. However, the BJP is hosting an "extended" National Executive this time on the birth anniversary of its founder Deendayal Upadhyaya. The convention is expected to adopt two resolutions. First, hailing demonetisation and the Goods and Services Tax (GST) as revolutionary measures taken in the national interest. Second, a political one as a look-ahead at 2019. At the end of it all, there will be a cultural programme for the BJP cadre. While preparations for the upcoming state polls and the 2019 general election will be part of the agenda, the meeting's focus will be on arming the delegates with an array of arguments against the critics of the government's economic policy. 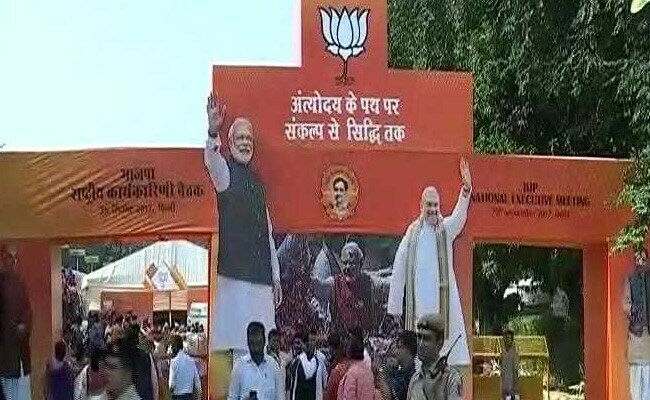 Thirteen Chief Ministers, 1,400 legislators, 280 parliamentarians - in all around 2,500 delegates - will gather at the Talkatora Stadium in Delhi today for a day-long session as the BJP sits down for its first-ever televised National Executive.